1/4 bunch parsley, chopped ? Preheat deep fryer, or at least three inches of oil in a pan, to 360°F. To make the spiedini, skewer the mozzarella and bread pieces tightly together in alternating order. 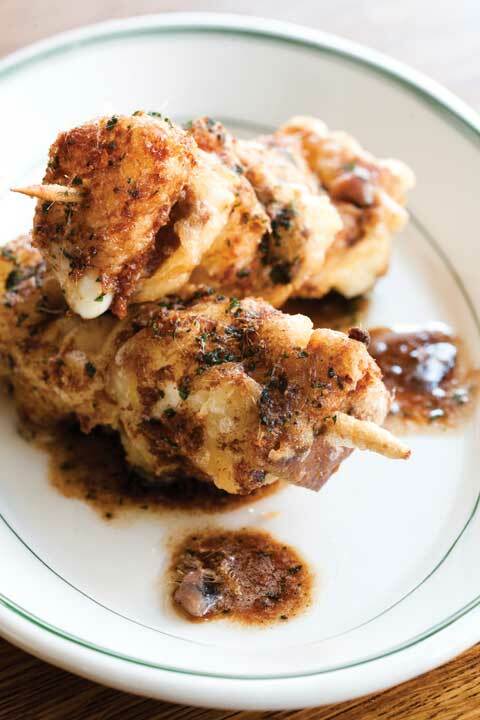 Each skewer should have three pieces of mozzarella and three pieces of bread on it. Place the flours and a pinch of salt into a mixing bowl, slowly whisk in sparkling water until it is a nicely coating tempura batter, stir in the egg yolk at the end. Batter two spiedini (skewers of cheese) and fry, turning once, until just barely golden. Meanwhile in a sauté pan, heat the butter with one clove of garlic and an anchovy fillet. Use a fork to mash up the anchovy fillet, and cook the butter into a nice nutty brown, fry a big pinch of parsley in the butter to finish it. Drain the spiedini and season with salt. Spoon brown butter-anchovy mixture over the skewers, discarding the garlic cloves.